Because our two-tier email signatures do not need to encapsulate all of a person’s contact information at the level of the email signature itself, the design process is really quite wide open. We will need you to provide input as to the direction you’d like to take. From a technical standpoint, we need to include one clickable link that goes to the landing page. This link should alert the viewer in some fashion that additional contact information is available with a click. If you wish to include more than one clickable link - website contact - for example, that can be done as well. Our form-driven email signature creation technology will be employed to create the personalized email signatures for users, regardless of the style selected. The graphic below illustrates three possibilities. Please note that the “One Graphic / One Link” style can be designed in just about any way you can imagine - there are very few limitations. If you have something different in mind, it is highly likely that we can easily accomplish it. 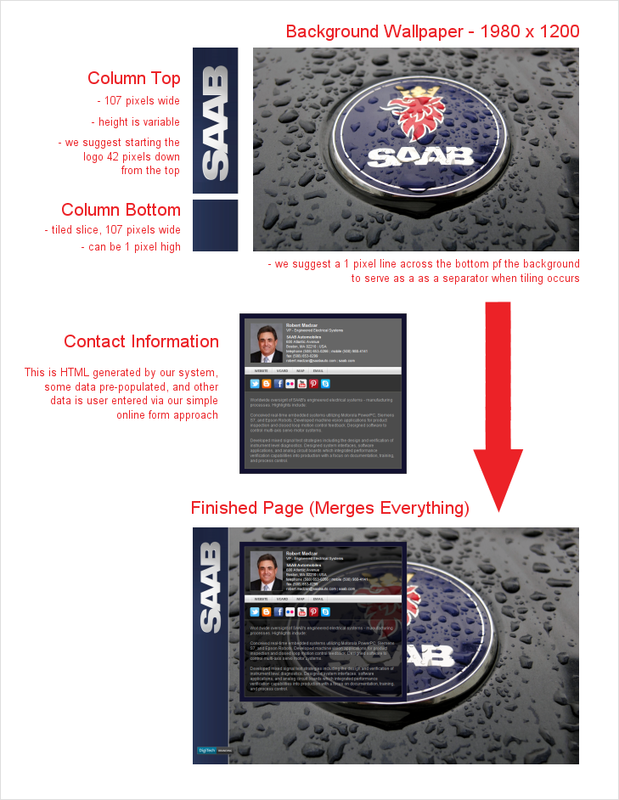 Landing Page: The most customizable portion of the landing page consists of two elements - a background wallpaper and a left-hand column (illustrated below). Please note that we are a technology company with limited graphics capabilities. Our graphic expertise gained over the years lies primarily in the area of logo manipulation and email signature layout. The creation of top-notch branded wallpaper is currently beyond our graphics capabilities - we will gladly direct you to an outside graphic artist if needed. The contact information portion of the page is completely data-driven. The primary choice is whether or not you wish to include the person’s photograph (this can be made optional if you wish). Other than that, we will make a few color decisions based on the background and column graphics, and will work with you on content decisions. In essence the contact portion of the landing page is no more than one of our full-featured email signatures - something we have extensive experience and expertise with.